Even though a homebrew return loss bridge is a relatively simple piece of gear to build, I’ve never gotten around to building one until now. Which is truly a shame, and something I don’t really have an excuse for, except perhaps laziness. I’m excited to add this essential gear to my stable of test equipment, as I know that I’m going to get a ton of useful data from it in the future. Now that I have all of the necessary equipment for measuring the return loss of the evolving dual gate MOSFET amplifier, it was time to get the job done. Based on the suggestions made on the EMRFD list, I modified the amplifier to incorporate the best practices that were recommended. First off, I tossed out the 100 kΩ gate 2 resistor, which was serving no useful purpose (except for dumping noise into the amp, according to W7ZOI). The bypass cap leads were clipped very short and soldered directly to gate 2. I’ll probably change this to a 10 nF or 1 nF cap in later iterations, but I took the lazy way out and left it as is for now. The other change was the addition of R2, the swamping resistor for the drain inductor. 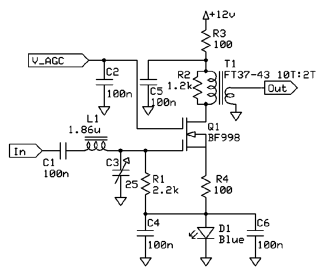 VAGC was set for 9 V, a point which should give nearly the full amplifier gain. Before taking the return loss measurements, I checked out the biasing and gain of the new amplifier configuration. Not surprisingly, the transducer gain dropped to 17.3 dB (-30 dBm input signal at 28.1 MHz), which of course was the whole point of adding R2. The drain current at this bias point is only about 2.5 mA, so there’s still lots of headroom in this amp. Using the procedure outlined in EMRFD, I measured the amplifier input and output return loss. The SG503 was set to 28.1 MHz with a -10 dBm output level and connected the the RF port of the return loss bridge (RLB). The detector port of the RLB was connected to the FPM-1 and a reading of detector power was made with an open circuit on the unknown port of the RLB. Next, I terminated the output of the amplifier in 50 Ω, connected the unknown port of the RLB to the input of the amp, and applied DC power to the amplifier. The difference between the two readings was the measured input return loss (S11), which was 10.0 dB in this case. Using a handy chart, I translated this into a VSWR of approximately 1.93. Given what I’ve seen in the literature about the poor input return loss characteristics of dual gate MOSFET amplifiers, I was actually pretty pleased with this number. I repeated the measurement, but this time I terminated the input in 50 Ω and connected the unknown port of the RLB to the amplifier output. This indicated the output return loss (S22) to be 11.9 dB, which is a VSWR of approximately 1.68. This shows that the load transformer is doing a fairly decent job of handling the impedance transformation on the output. This was a simple test, but the results were satisfying. In the current state, this amplifer should work fine if integrated into a large system, such as a receiver. The real question is the effect that the 2.2 kΩ termination on gate 1 has on noise figure. Speaking of noise figure, I plan to make this measurement next, but I have quite a bit of work to do first. In order to characterize the ENR of my noise generators, I’m going to need to get my hands on a true-RMS detector. I’ll probably end up building the one that Sabin describes in his paper on the EMRFD CD that deals with measuring receiver sensitivity and noise. But that means waiting, since I have to order a few of the parts. I’ve also got more reading to do in order to better understand everything that’s going on with noise figure measurements. I also need to start thinking about how I’m going to get my hands on a spectrum analyzer to make IMD measurements. Which is funny because I work on very nice spectrum analzyers every day at work!